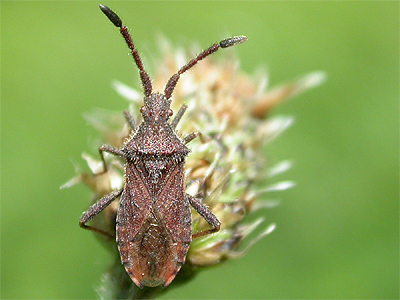 Seen with much less frequency that Shieldbugs, Squashbugs (Coreidae) are an uncommon find in Nottinghamshire for those recording our invertebrate fauna. 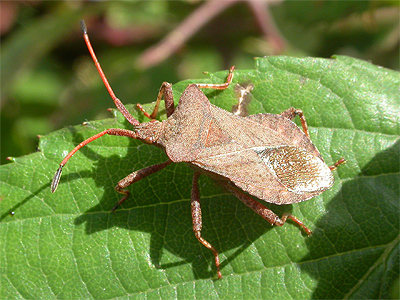 Several species are large, and certainly the impressive Dock Bug, is much larger than both Green and Hawthorn Shieldbug. 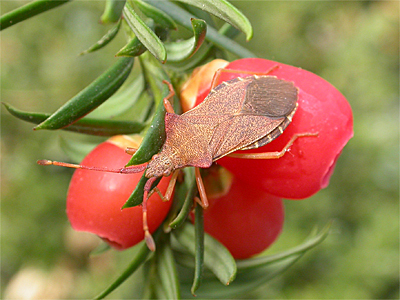 What some Squashbugs make up for in size, they don't come close to rivalling Shieldbugs for colour and markings and they are considerably more subdued in their overall colouration. They feed mainly on fruits and seeds and also possess stink glands, producing a strong and unpleasant odour when handled. They are particularly associated with sparsely-vegetated or bare ground habitats. All overwinter as adults and they are fully-winged (macropterous) insects with antennae of four segments. The abdomen is usually broad and expanded laterally, giving them a flattened appearance. 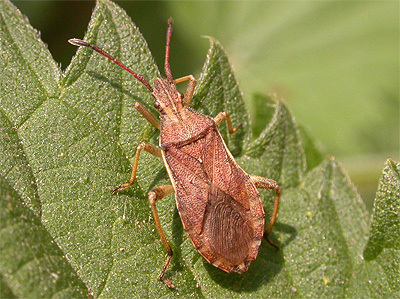 Eleven species of Squashbug are presently known from the UK, following the arrival of the American Western Conifer Seed Bug from continental Europe, but only two species are classified as common. 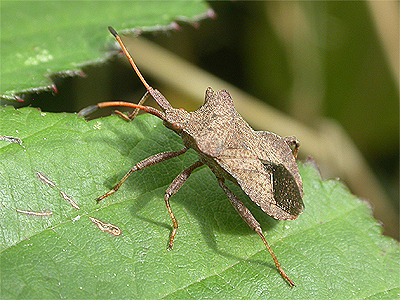 Of the eleven species, five occur, or have occurred in Nottinghamshire over the past number of years and our commonest and most widespread species is Denticulate Leatherbug (Coriomerus denticulatus). 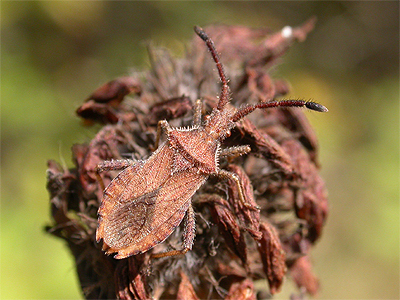 Squashbugs have traditionally been insects with a strong south-easterly bias in the UK and they have a relatively brief Nottinghamshire history, with just one traceable record of Slender-horned Leatherbug (Ceraleptus lividus) from Newark in 1858. 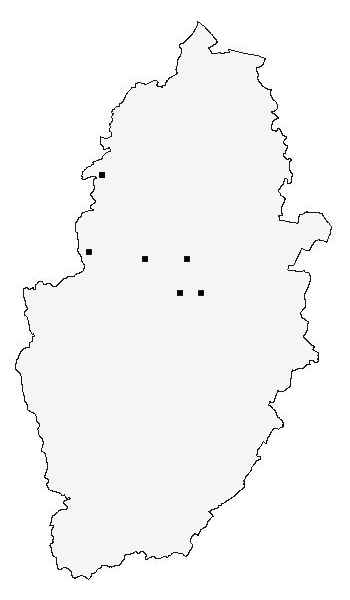 The present list of Nottinghamshire Squashbugs (Coreidae) is given below, with the location and date of each species' first record on the right. Found on Clovers (Trifolium sp) and Trefoils (Lotus sp) growing in dry, grassy sites, Ceraleptus lividus is largely restricted to areas of the south-east UK and remains a rare find in Nottinghamshire. There may be some evidence of under recording and it is strange that this Squashbug has yet to turn up at well studied sites such as Attenborough NR and Netherfield Ash Lagoons. 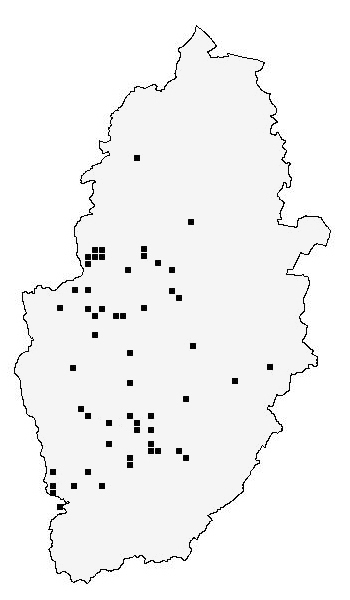 All of the county's known records are presently from central Nottinghamshire. Apart from a single historical record from Newark in 1858 (Thornley), all records for Nottinghamshire seem to have been found by ourselves and this is a species which we have recorded on several occasions. Despite the fact that adults can be found all year round, we have only found this species in Spring at the following list of sites - Eakring Flash 23/04/07, Sherwood Forest CP 28/05/07, Hare Hill Wood 28/06/09, Warsop Main Pit Top 15/06/11 and Wellow Park 31/05/13. An impressively large Squashbug that is widespread in the south of the UK and currently spreading northwards. The nymphs and adults feed on Docks (Rumex sp) but they will occasionally wander on to other low vegetation. Nottinghamshire's first record was thought to have been from Netherfield in 2012, but there is a record listed on the NBN Gateway for Nottingham University (recorder unknown) in 2007. It is currently known from along the Trent Valley in south-west Nottinghamshire, all of which are within close proximity to the City itself. The county's most recent record from a recreation ground on Valley Road close to Nottingham City Hospital, is the first record away from the Trent Valley. Records have come from the Long Eaton (including just into Derbyshire), Beeston Sidings, Toton Sidings and Attenborough NR areas, with additional records including Colwick Park and close to Nottingham City Hospital. While researching previous county records on the NBN Gateway, we found some discrepencies with some sites and grid references. Coriomeris denticulatus is Nottinghamshire's commonest Squashbug and fairly easy to identify by being distinctly bristly on the legs, antennae and pronutum. Fairly common in the western-half of Nottinghamshire up to Clumber Park, where it was recorded as being new to Nottinghamshire in 1994. Generally found in dry habitats on chalky or sandy soils, Coriomeris denticulatus is another predominantly southern UK species, with records extending as far north as Yorkshire. 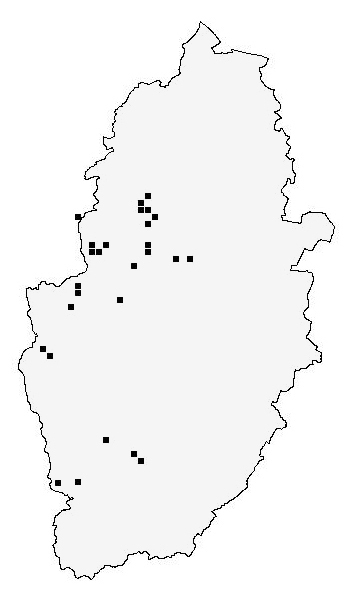 Correspondigly, most of the records from VC56 (Nottinghamshire) are from sites on Magnesian Limestone or Sherwood Sandstone. It is often found on former Colliery spoil heaps by sweep-netting areas of Black Medick (Melilotus sp) and Clovers (Trifolium sp). Known sites include Warsop Main Pit Top, Annesley-Bentinck Pit Top, Ollerton Pit Woods, King's Mill Hospital wildlife garden, Rock Cemetery in Nottingham and Sherwood Forest Golf Course. Discovered as new to Nottinghamshire in April 2015, when Tim Sexton recorded the county's first specimen at Attenborough NR. 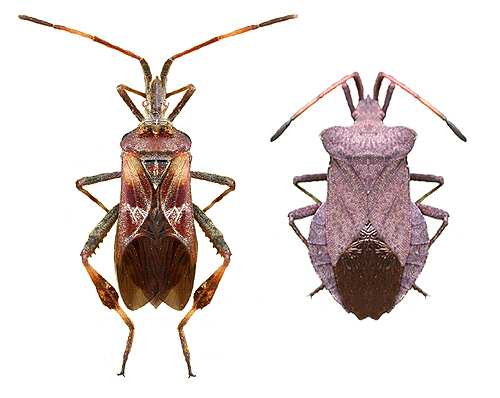 Known historically as a Red Data Book 1 (endangered) species and only from Box Hill in Surrey, Gonocerus acuteangulatus has rapidly increased it's range to cover large parts of the south-eastern UK. It was recorded in Leicestershire for the first time in 2014, so its arrival in Nottinghamshire was only to be expected. Now found on a variety of trees and shrubs, Tim found the specimen shown on Cherry. More records should follow in the coming years and trees such as Hawthorn, Plum and Yew should be beaten if searching for this Squashbug. 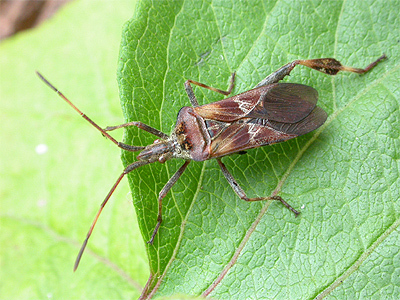 The Western Conifer Seed Bug is a large North American species, recorded in Europe for the first time (Italy) in 1999. It spread rapidly through the near continent and eventually appeared in the UK at Weymouth in 2007. There were further records following an influx into the UK during the latter part of 2008 including a number of inland records - the most northerly being at Kendal in Cumbria. Nearer to Nottinghamshire, there were records from Quorn (Leicestershire) and Charlesworth (Derbyshire) the same year. It has since been recorded across most of the southern UK, in a line south of Liverpool and Newcastle-on-Tyne. Most of the UK's early Leptoglossus occidentalis records came from MV moth traps operated along the south and south-east coasts and this is perhaps still the most likely way of finding the large adults. They do sometimes occur indoors during the late Summer and Autumn, which is exactly what Nottinghamshire's record did. 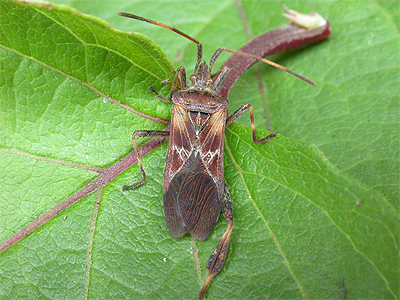 The specimen pictured below, was found on bedroom curtains by Moira and David Worthington at Eakring on September 27th 2009. Moira emailed a picture to us for possible identification and thankfully retained the specimen. There have been at least 16 other records of L. occidentalis since, almost all coming from suburban Nottingham during the Autumn and Spring. The following distribution maps are sourced from the records of the following list of individuals and organisations/survey results and are as accurate as can be (as of October 2016) with the records and data we have at our disposal. We have again refrained from using historical records listed in J.W. 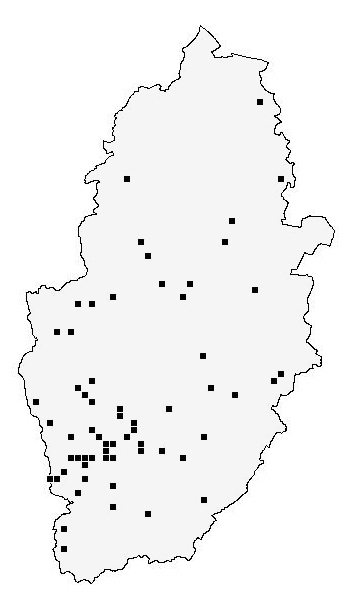 Carr's book 'The Invertebrate Fauna of Nottinghamshire' in any of the maps, in order to keep the distribution consistant with current knowledge.